Katrin received her BSc and MSc degrees from Simon Fraser University, with the latter being based on a study of Eocene volcanism and tectonism in south central British Columbia. 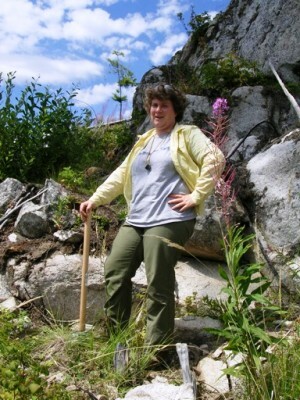 She then taught various undergraduate courses as a sessional instructor (UBC, SFU), and undertook various contracts to compile the geochronological dataset for various territorial, provincial, and federal geological surveys (YGS, BCGSB, GSC). Katrin remained active in the area of slab window research, before beginning her PhD project at UBC (PCIGR) in September 2005. The current project focuses on the relationship between plate boundary conditions (slab edges) and magma sources at convergent margin settings, as determined from isotope and trace-element geochemistry, and on applying the isotopic data to outstanding tectonic problems for Mesozoic assembly of the Canadian Cordillera. This Ph.D. project bridges the petrologic, economic, and tectonic disciplines of study of convergent margins at the Mesozoic Canadian Cordillera type-setting for crustal growth by accretionary tectonism. The project objectives are threefold: 1) To advance the petrologic knowledge-base of subduction zone magmatism by examining possible linkages between slab dynamic and magma source at various stages of subduction; 2) to examine the role of convergent-margin magma sources with respect to metallogeny of temporally restrictive porphyry deposits along the arc; and 3) to test a subset of previously published tectonic hypotheses regarding the specific style and timing of assembly of inboard terranes of the southern Canadian Cordillera. The petrogenetic working model envisages that changes in slab dynamic at the nascent convergence, steady-state subduction, and accretion/post-collision stages of a subduction cycle and exert a strong control on available sources contributing to magmagenesis (supra-slab mantle wedge, subducted oceanic sediments, basaltic crust of the slab, and sub-slab asthenosphere). The major tool being applied is multi-system radiogenic (Sr, Nd, Pb, Hf) and stable (O) tracer isotopes, and high-resolution trace-element geochemistry. The new geochemical dataset comprises >70 samples representing 5 time-correlative suites or pulses of magmatism from Late Triassic (Norian and Rhaetian), Early Jurassic (Sinemurian and Pleinsbachian) and Middle Jurassic (Oxfordian) intrusions of the southern Quesnel terrane, and a smaller complementary dataset from the Stikine terrane. The project necessitated new U-Pb age determinations for 6 of the geochemical samples. The economic hypothesis assumes that examination and quantification of the role of subducted sediments source of the primary magma has potential to yield a new metallogenic model for Cordilleran Cu- and Au-bearing porphyry systems. More generally, the project dataset has already begun to provide tools for the exploration community, through the provision of a “isotopic fingerprint” template by which to discriminate between Triassic alkalic Cu-Au±Ag mineralized porphyry intrusions of the Copper Mountain suite, calc-alkaline Cu±Mo±Au porphyry phases of the Guichon suite, and variably barren to Cu-bearing, alkalic and calc-alkaline pulses of Jurassic magmatism which followed. The tectonic working model is based on the ability of tracer-isotope studies to provide a means to quantify crustal contamination in arc magmas. This information, when coupled with the relatively robust existing U-Pb geochronological dataset Mesozoic intrusions of the southern Quesnel terrane, will provide constraints on the affinity and structural relationship of the Quesnel arc stratigraphic package relative to underlying Precambrian, North American crust.